There are many change management and version control tools out there. Many of them are good only at doing this for files. 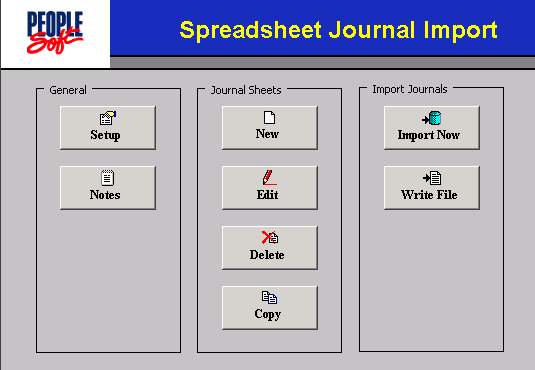 As such, PeopleSoft, which is mostly meta-data driven, might not go along well with these. At the same time, Oracle doesn’t provide a version control feature for PeopleSoft. So how do we tame change? Here are some tools available in the market which can do version control and much more for PeopleSoft. This is in no way a comparison of these products, in fact, far from it. Stat for PeopleSoft, one of the most widely used version control tools, comes from Quest Software which was acquired by Dell in Sept 2012. It is a self-contained system (built outside of PeopleSoft) that fully integrates with PeopleSoft using the command-line interface. PeopleSoft objects and flat files can be versioned and indefinitely stored in the Stat repository. At any time, modified objects and files can easily be recovered or rolled back to a prior version. This product page has a complete list of features provided by Stat. Built on PeopleTools technology, Phire has been helping PeopleSoft customers since 2006. This tool helps developers version and store files and PeopleTools objects in the Phire Architect repository from where it can be restored if need be. Since it’s built with PeopleTools, the look and feel is similar to other PeopleSoft applications. For more on Phire Architect visit their website. CAPI from mcAMDOIS, though a recent entrant into the market, is fast expanding. CAPI too is built using PeopleTools giving you a tight integration with PeopleSoft thus leveraging its security and boasting off a quick install. More on CAPI’s features here. Integrity was developed by MKS which was acquired by PTC in May 2011. Now known as PTC Integrity, this solution is an extension of MKS’s application lifecycle management platform. More on this tool here. Beacon Services’ acquisition of the majority assets of Newmerix Corporation in 2009 gave it rights to Newmerix Automate! Suite. BEAM is an enhanced version of the Newmerix’s product. BEAM is delivered as a PeopleSoft project and installed into a dedicated environment. From here, it connects to all other PeopleSoft environments using DBLinks. The BEAM suite has three products – BEAM Change, BEAM Compare, and BEAM Test. Out of these, BEAM Change is the one that provides versioning capabilities. More info can be found here. This product comes from Grey Heller Solutions which was founded by PeopleSoft veterans. The product provides a Developer plugin that plugs into the App Designer – nothing like I have seen before. It has a Version Control Repository which is managed separately from PeopleSoft using a widely used version control tool. It can support PeopleSoft objects as well as non-PeopleSoft objects. There are also many other features, you can have a look here for details. What version control tools do you use? We asked this question on Facebook and got the below results. 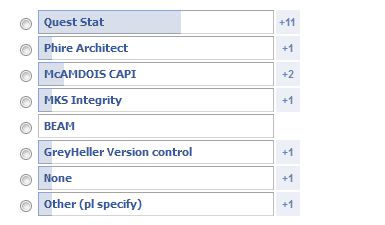 Now, which version control tool do you use? « Inserting into Record with Long Character Fields » 66 PeopleSoft Presentations from OOW 2013 – Ready for Download! Great info and compilation Rakesh! Well done!